In association with HotelMap we are delighted to be able to offer our delegates specially discounted rates at a wide range of nearby London hotels. 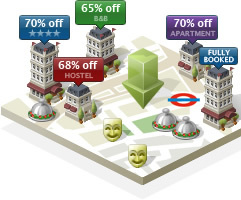 It is very easy to use and provides the simplest way to find the perfect place to stay near to The Annual Regulatory Affairs International Symposium 2010, but if you want to stay elsewhere in town, it shows you hundreds of accommodation options throughout Greater London. It is unique in that it connects directly to each hotel's own reservation system, providing real time access to every available room in the hotel and not just an allocation of rooms. Bookings are made instantly with the hotel's reservation system so no more worrying about whether the hotel knows you're coming. It features all types of hotels - from 3 star through to 5 star, including bed and breakfasts, apartments, and even hostels. It provides you with instant access to the largest discounts and lowest rates in the market - guaranteed. Plus, it includes exclusive special offers including free gifts with each hotel booking. It does not take one penny from you. All payments are made directly to the accommodation operator, usually at check-out.